My research interests are in the areas of philosophy of mind, philosophy of science, philosophy of religion, and political philosophy. Right now these interests are finding expression in three projects. First, I’m working on a book on Newton’s conception of science and the manner in which it was received and challenged by David Hume. It’s tentatively called Newton and Hume: On Science, the Mind, and the Nature of Reality. I also have a long-term project working on basic operations of the mind and their contribution to foundations of reality (major influences here are Hume and Bergson). 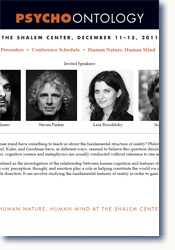 In 2011, I organized a preliminary conference on this subject in Jerusalem together with Jesse Prinz of the CUNY Graduate Center, which we called “Psycho-Ontology.” One of my first papers from this project is “A Solution to the Problem of Basic Emotions,” which was presented at the Society for Philosophy and Psychology. Finally, I’ve been doing quite a lot of work recently in philosophy of religion. I’m directing an international research initiative in Jewish Philosophical Theology that has received two major grants from the John Templeton Foundation. 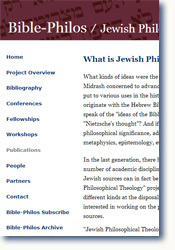 This is a project that seeks to develop techniques for the philosophical investigation of the Hebrew Bible, Talmud and Midrash. My book The Philosophy of Hebrew Scripture is intended as an introduction to this subject. I am now writing a follow-up book explaining and defending the God of the Hebrew Bible. “Newton and Hume,” with Eric Schliesser, in Paul Russell ed., Oxford Handbook on Hume (Oxford: Oxford University Press, 2016). Review of Stefanie Rocknak, Imagined Causes: Hume’s Conception of Objects in British Journal for the History of Philosophy (September 2014). “Newtonian Explanatory Reduction and Hume’s System of the Sciences,” in Zvi Biener and Eric Schliesser, eds., Newton and Empiricism (Oxford: Oxford University Press, 2014), pp. 138-170.
Review of Jacko Gericke, The Hebrew Bible and Philosophy of Religion in Theologische Literaturzeitung (September 2013).